When you’ve been working all day, non stop, it’s easy to fall into that slump mid afternoon. You feel tired yet full of restless energy, your body is aching from being sat in the same position all day and you’ve got tunnel vision to a problem on a project you’ve been working on. All of these things are clues that it’s time for a break! Giving yourself a few minutes away from what you’re doing and to clear your mind can make such a big difference, it’s all about working smart and those few minutes away from your desk can actually improve your productivity for the rest of the day. Here are some of the ways you can give your brain a boost during the working day. Dehydration can massively impact the way that we think and our productivity, and it’s easy to be a little dehydrated without even realising. Go over to the water machine and gulp down some cold water. It will wake you up, reinvigorate you and could well make your thought processes a little clearer for the rest of the afternoon. If you’re really struggling and need some extra help getting through the rest of the day, a caffeine boost could be really helpful. 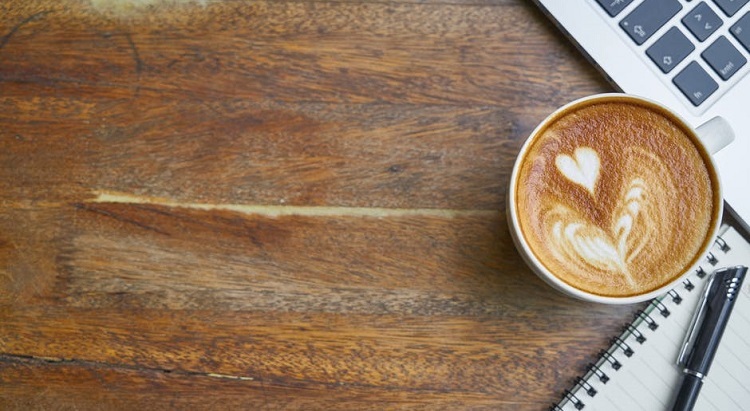 Having a coffee will wake you up and give you the extra bit of energy you need to push through and complete the tasks that you need to get done. Just be aware of how caffeine affects you, some people are particularly sensitive and you might find that you can’t sleep that night. If that’s the case, have a tea or a cola instead which contains less caffeine but should still give you a bit of extra energy. The problem we can have when we’re working on something for a long time is it’s easy to develop ‘tunnel vision’ and it can make solving problems difficult. Perhaps you’re no longer spotting mistakes in the text or emails you’re writing. Maybe there’s an issue that you just can’t figure out or you might keep making the same error over and over. In this situation, you’re best giving your brain a break. Move away from your desk and look up from your work, and distract yourself with something else instead. Whether you have a quick break to play the Final Fantasy mobile game or do a crossword in the newspaper, once you come back to what you were doing you’ll find it much easier to get an objective point of view. It seems strange that the less activity you do, the more tired you can actually feel. But it’s so true, and when you’ve been sat in your seat all day you’ll naturally feel tired and sluggish. To give your brain a boost, get up out of your seat. Go for a walk around your office building, or do some stretches. You don’t need to do a full on gym workout, but moving around and getting the blood pumping a little will certainly wake you up and clear your head. If you feel like dozing off onto your pile of paperwork, stand up and take a quick walk somewhere.